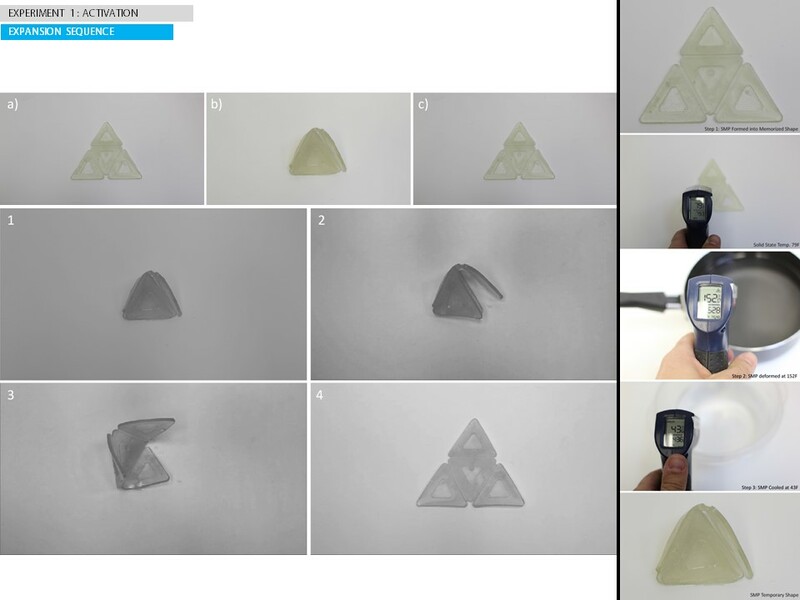 Shape-memory polymers (SMPs) are an emerging class of “smart materials” that have dual-shape capability. They are able to undergo significant deformation when exposed to an external stimulus such as heat or light. 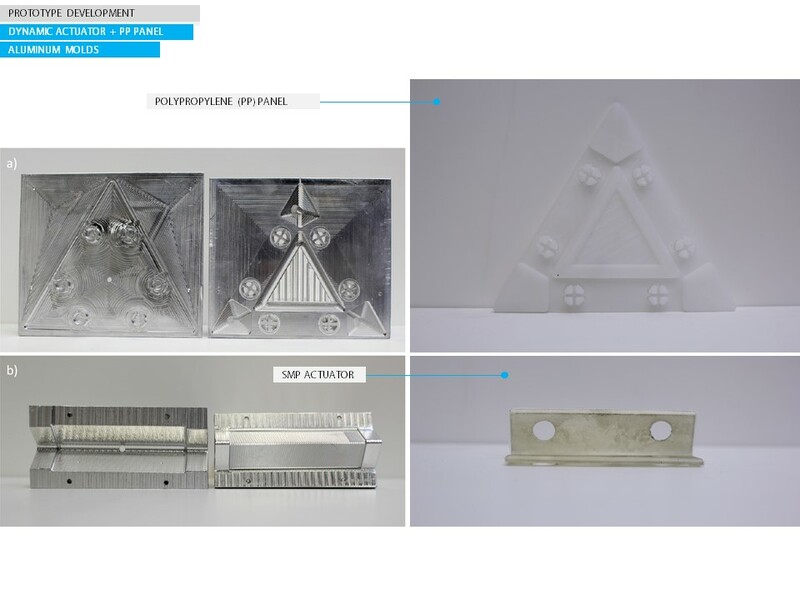 SMPs have been widely investigated within the biomedicine and aerospace industries; however, their potential has yet to be explored within an architectural framework. 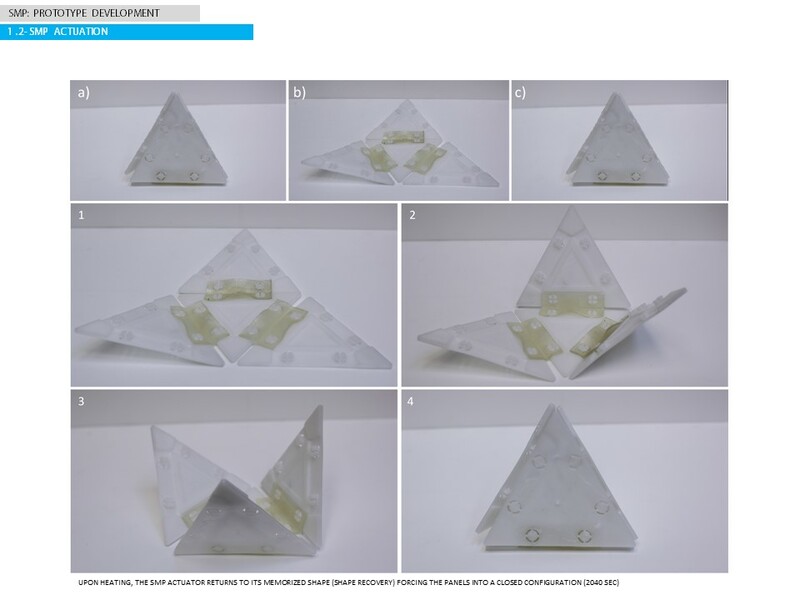 The research presented in this post begins an investigation into the morphological behavior of SMPs toward a deployable, adaptive architecture. The structure’s ease of assembly, compact storage, transportability and configurable properties offer promising applications in emergency and disaster relief shelters, lightweight recreational structures and a variety of other applications in the temporary construction and aerospace industry. 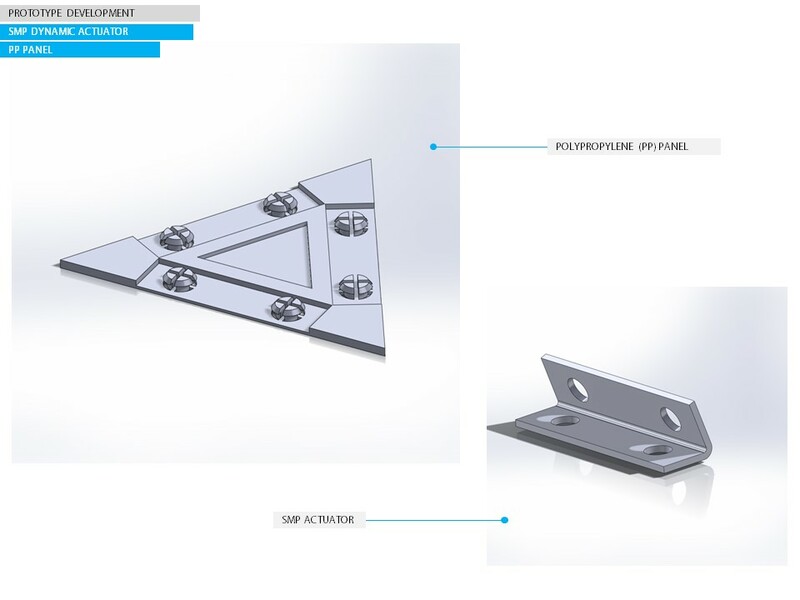 This post explores the use of SMPs through the development of a dynamic actuator that links a series of interconnected panels creating overall form to a self-standing structure. The shape-shifting behavior of the SMP allows the dynamic actuator to become flexible when storage and transportability are required. Alternatively, when exposed to the appropriate temperature range, the actuator is capable of returning to its memorized state for on-site deployment. 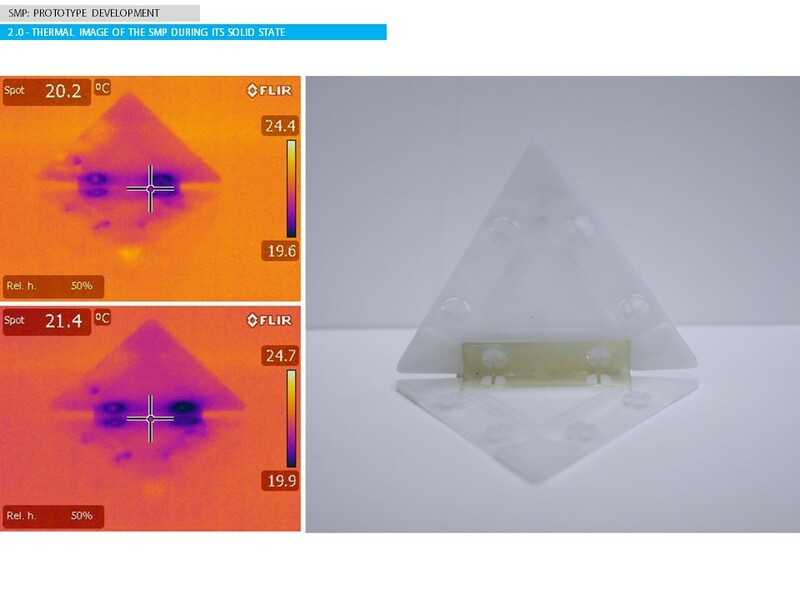 Through a series of prototypes, this post will provide a fundamental understanding of the SMP’s thermo-mechanical properties toward deployable, adaptive architecture. Deployability: The first application begins to assess the feasibility of the dynamic actuator’s capacity for deployment without any external force or mechanical assistance required. This necessitates an investigation into the mechanical properties of the SMP and more specifically, a quantitative analysis on the amount of force required from the actuator to successfully displace a panel element during its recovery sequence (i.e. transition from an elastic to a glass state). 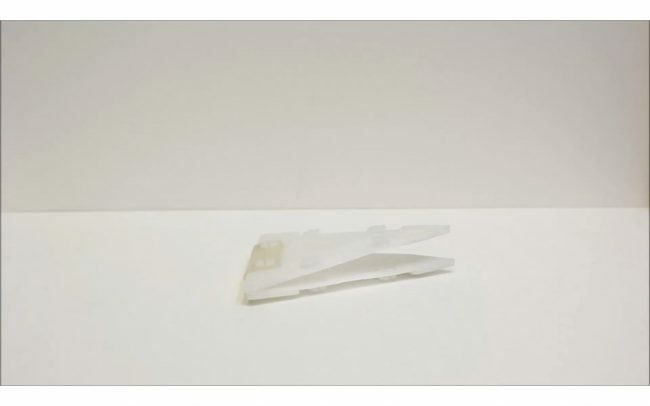 Adaptability: The second application focuses less on instant deployability but rather on the actuator’s morphological behavior towards configurable and adaptable systems. 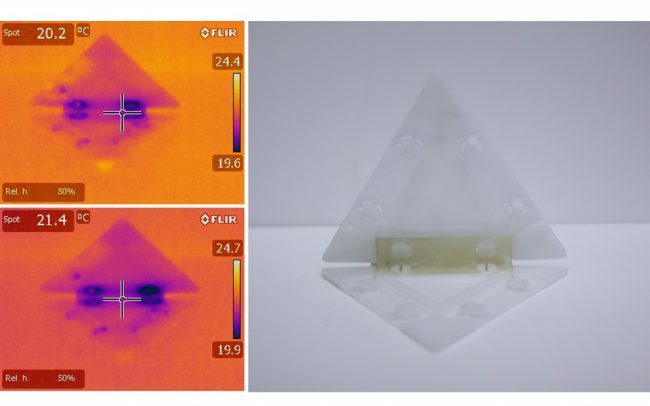 The thermo-responsive properties of this material would allow the actuator to become flexible when heated above its Tg thus allowing the structure to be positioned into a desired shape. Upon cooling below its Tg, the SMP would enter its glass state (solid state) to allow the structure to achieve its desired locked position. Panels could be removed or inserted for added functionality. In addition, the Tg could be programmed to meet specific climatic requirements. 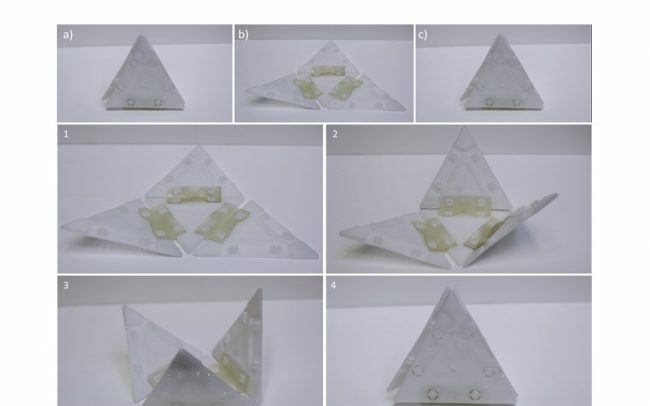 A physical prototype of the dynamic actuator and interconnected panel was developed in order to gain insight on the morphological properties of the shape memory polymer. The actuator and panel elements were designed concurrently in order to meet the following criteria: i) to allow for a snap-fit design application and, ii) to produce a system that would return to its final deployed condition upon successful activation of the SMP. 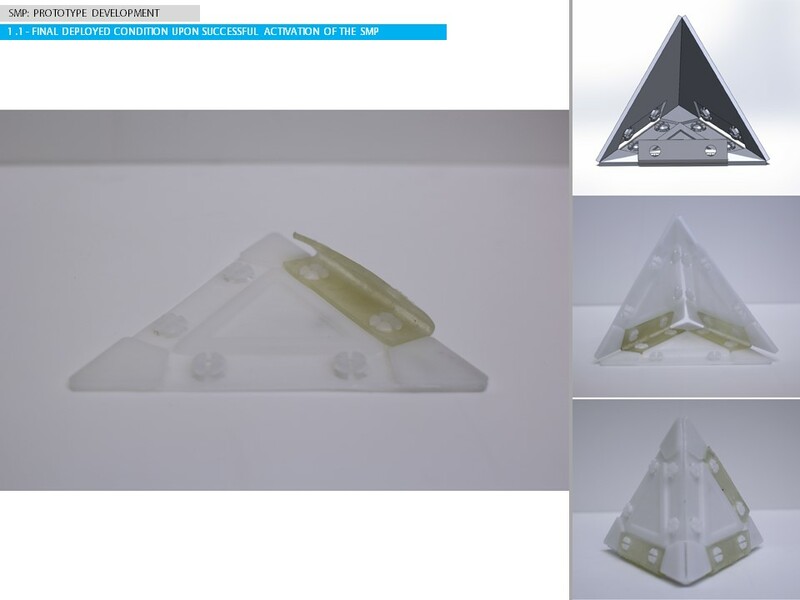 The actuator mold was milled from a 1” aluminum block and formed into its memorized “closed” shape via injection molding processes. 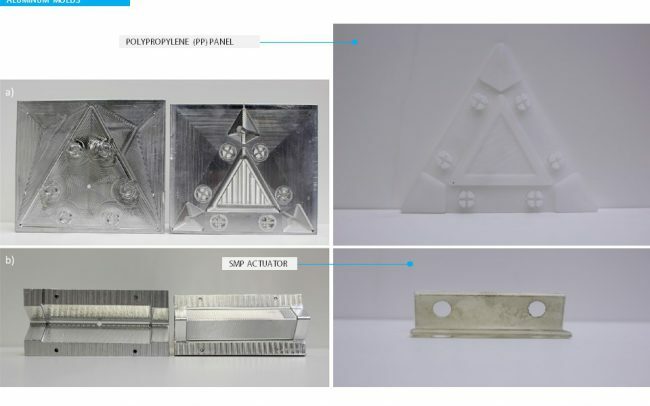 The panel was made from a polypropylene (PP) polymer which was selected for its low density and high stiffness attributes thus facilitating the SMP’s ability to actuate the module. 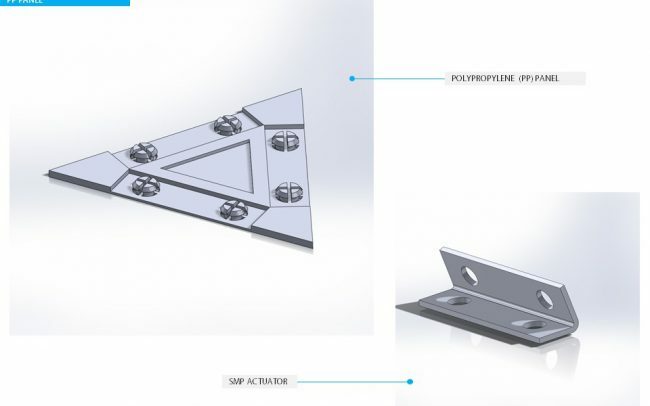 Once formed, the SMP actuator was heated above its Tg, constrained into an open configuration where it was cooled and fastened to the polygonal panel to form the assembly. This process was repeated for all three actuators and their corresponding panel. Upon heating, the actuators were successful in returning to their memorized shape forcing the panels into a closed configuration. Further investigation into the cross sectional properties of the actuator will be required in order to identify the factors contributing to its recovery strength. 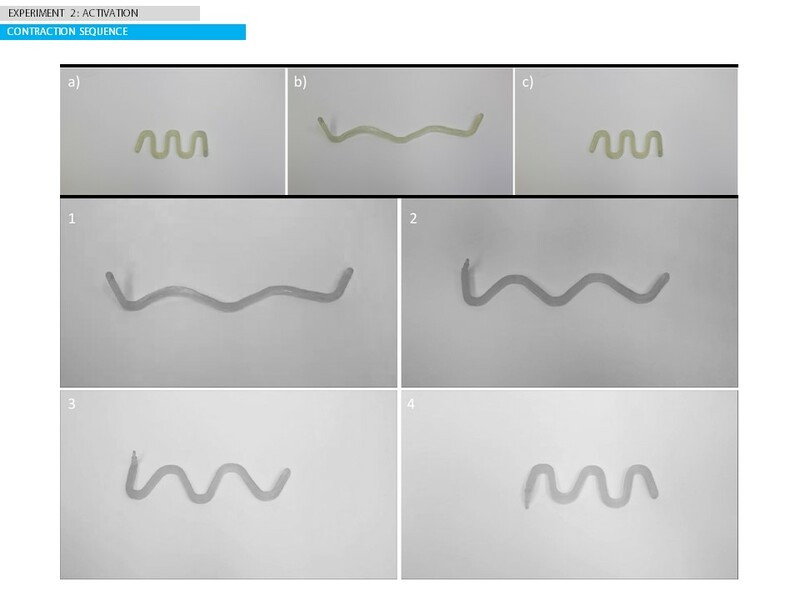 This research investigates the thermo-mechanical behavior of an emerging class of polymers as an alternative approach to traditional mechanical methods of actuation. 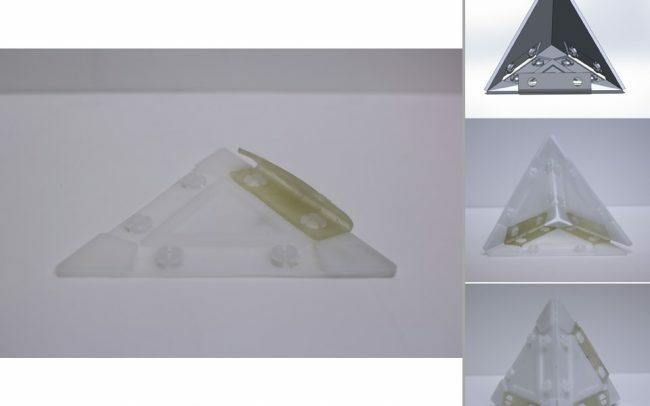 More specifically, it begins to examine the morphological behavior of SMPs towards deployable, adaptable architecture through the development of a dynamic actuator that connects a series of interconnected panels giving overall form to a self-standing structure. 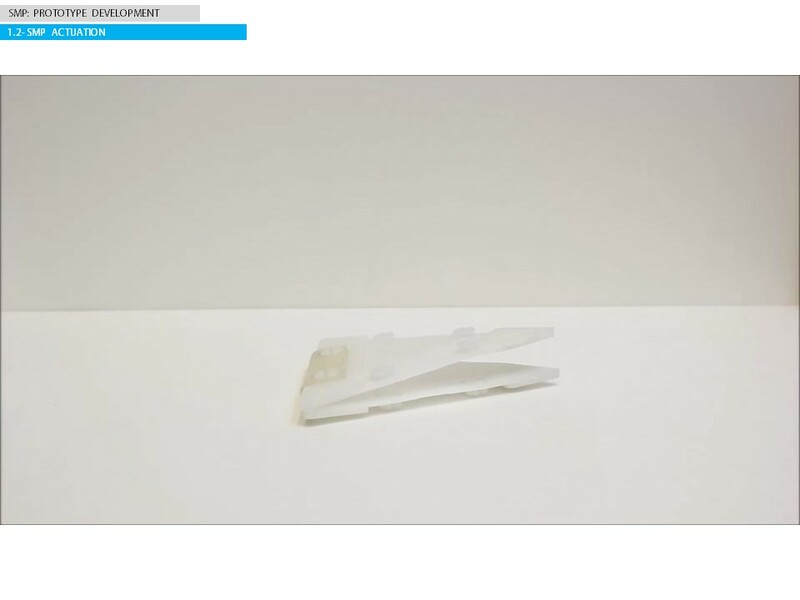 The preliminary studies presented in this paper, although in its early stages, begin to reveal the potential implications of shape changing materials within the praxis of architecture.